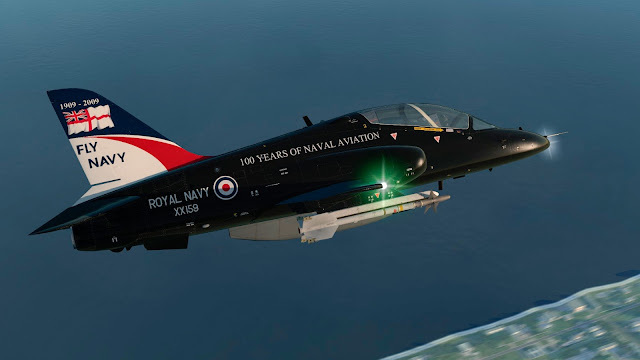 The Hawk T.1A for DCS World was released in early 2015 by VEAO Simulations, a flight simulation company based in the UK. 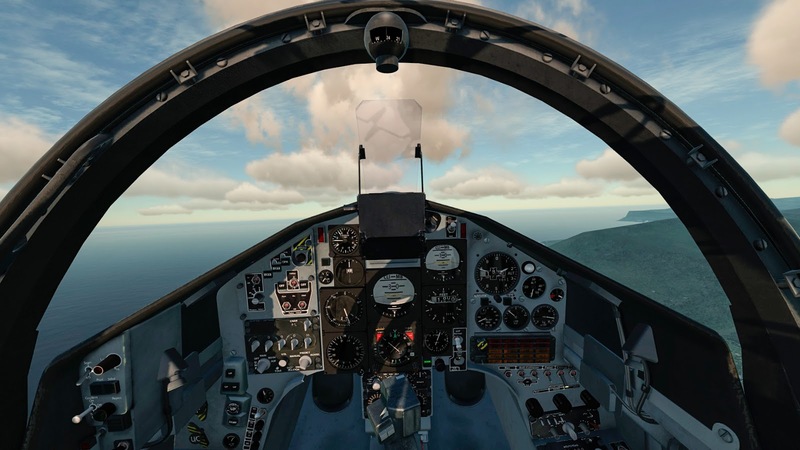 Currently this module is available both on Steam and the DCS store in its beta state. 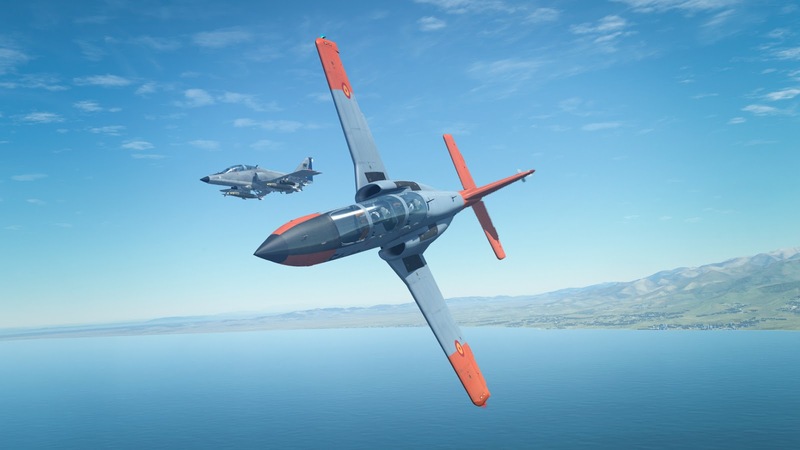 The Hawk is an advanced, jet powered trainer designed by BAE Systems. It flew for first time in 1974, and entered service two years later. This aircraft is still in production, and as of today, over a thousand of units have been built. Some of the original Hawk T.1's were upgraded, thus becoming Hawk T.1A's (the one depicted by VEAO). This variant can carry two Sidewinder air to air missiles, plus a gun pod. It's also the variant employed by the well known Red Arrows aerobatic team. What do you get with VEAO's Hawk? Even though the module is still in beta state, you get a mostly finished aircraft, in a more advanced state than the C-101 (just an example). 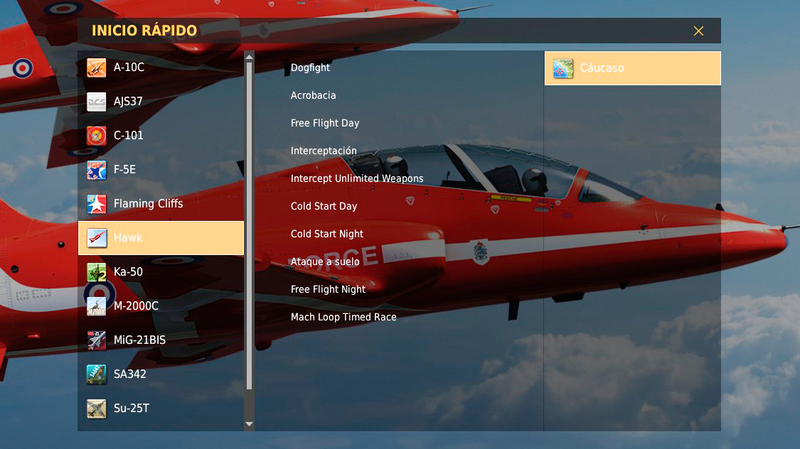 You also get some missions, which range from doing a cold start to trying to perform the best time in a Mach Loop themed timed event. 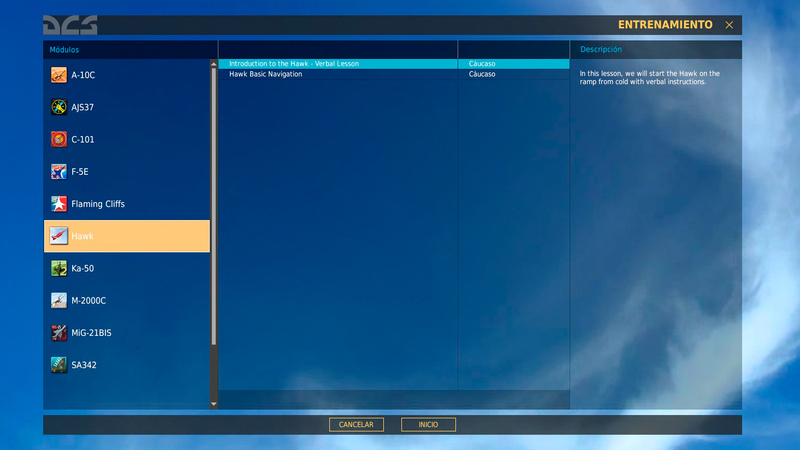 Two training missions are also included. And finally, more missions. Or... Take a close look and you'll see they're the Instant Action missions! Inside the documents you'll find Chuck's guide and a quick start manual. The quick start manual is available in English and Chinese. 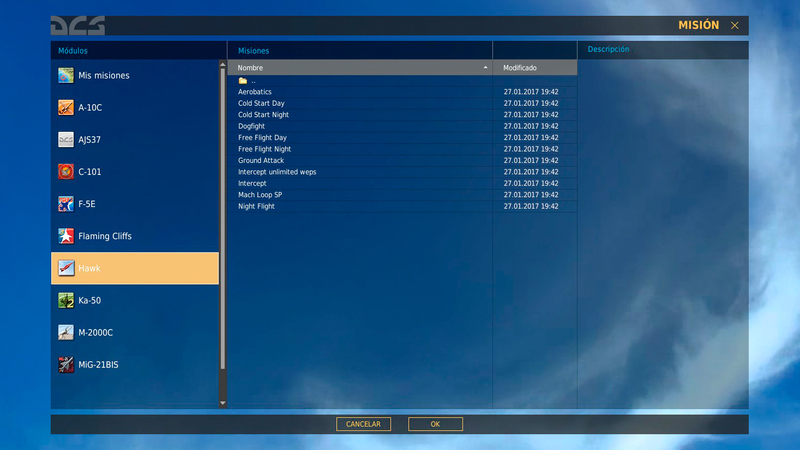 The Hawk module is downloaded and installed from the in-game DCS download manager. The download size is of approximately 400MB. 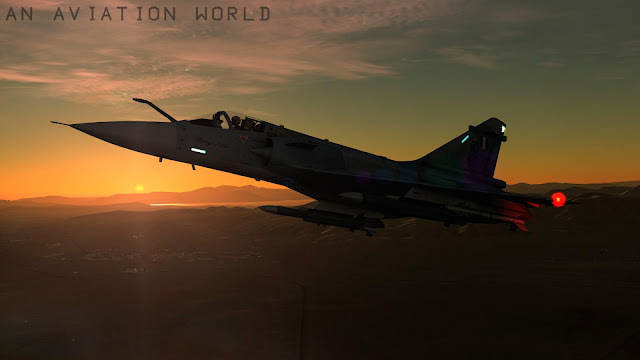 If you're active on the DCS community you've probably heard of the Hawk by now. Most people aren't too happy with the flight model, but to be honest, I don't really see a reason for that. The Hawk has an External Flight Model, which according to Eagle Dynamics "uses only a part of PFM (Professional Flight Model); rigid body physics and contact model". 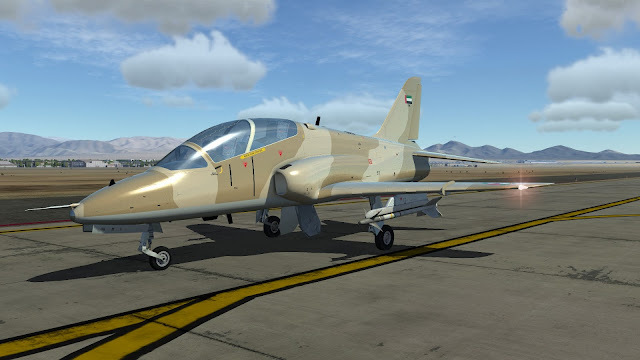 In the short time I've been flying the Hawk, I've found it to be an extremely agile airplane, but I guess it's realistic (I'll trust VEAO on this). The only thing I find annoying is the damage model. 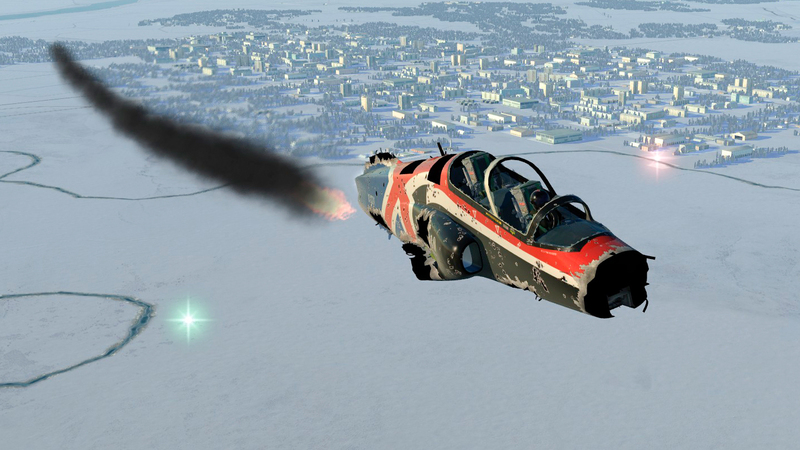 Although VEAO say the Hawk includes a "highly detailed damage model", I've had some weird experiences with it. After contacting VEAO Simulations I got told that they're still waiting for Eagle Dynamics to inform them about their new damage model, so this will probably be fixed soon. As with all full fidelity modules, you get a fully interactive cockpit. The Hawk is a dual seater, and both the front and rear panels are modelled. Both panels are fully functional. When you enter a multiplayer server, you find the option to hop onto another Hawk (if anyone is using it), but I'm not sure if this is currently working, as I wasn't able to test it. The performance (FPS) in the cockpit is really good, I get 60 FPS all the time, even with bad weather. The startup process involves quite a few steps, but after some tries it'll be easy to remember. 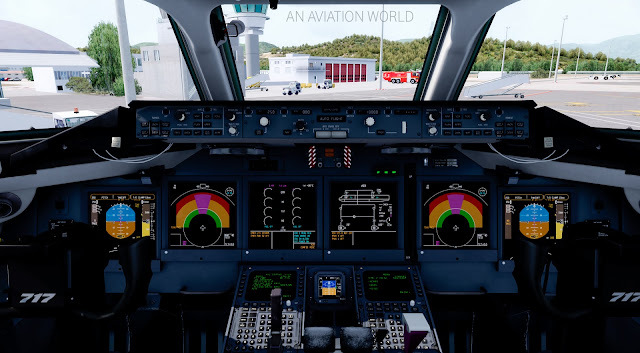 All the gauges are crisp and easily readable, and systems are modelled in-depth. The Hawk's external model is pretty much on point with the real one. Every little detail is there, and lets be honest, it looks beautiful. The textures are of high quality too. As expected, all control surfaces move smoothly. 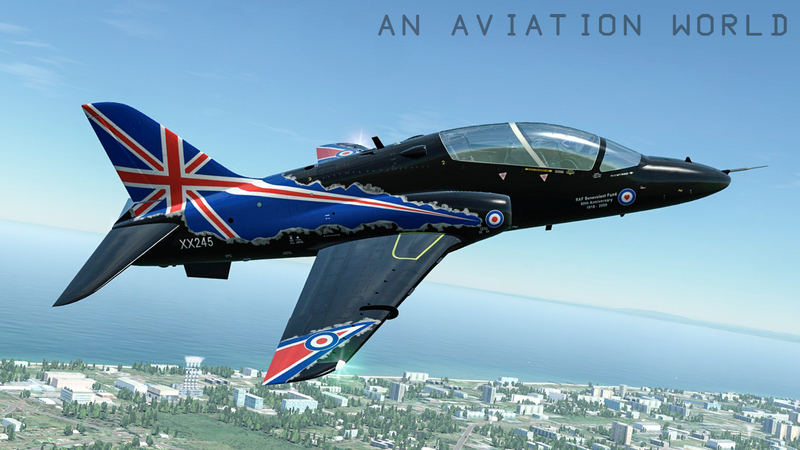 Most of the liveries included are of different RAF Hawk squadrons (including the Red Arrows), but you also get an UAE and USAF livery. The sounds included are also realistic. The Hawk can also be used as a weapons trainer. You can load two AIM-9L misisles on the side pylons if you want air to air combat, or rocket pods, bombs or practice bombs for air to ground missions. The Hawk T.1A also carries a 30mm ADEN gun pod. I didn't get too much time to fly the Hawk, but in the few test flights I did, I found it to be a really fun aircraft, totally opposite to what people said on forums. 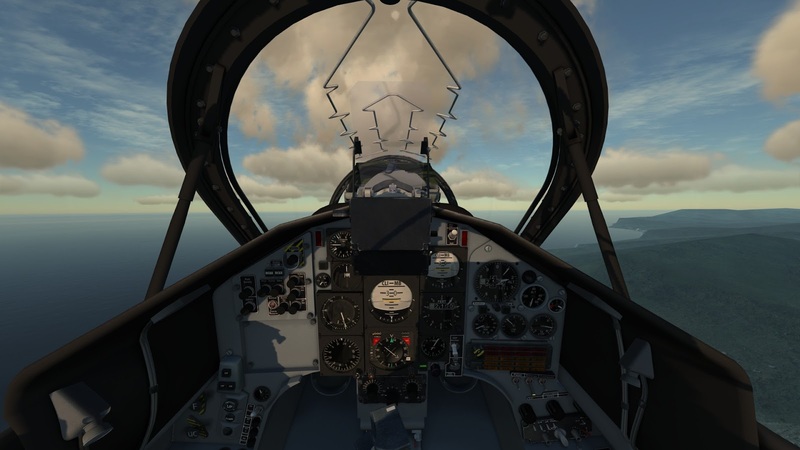 It's rather limited when it comes to fighting in multiplayer combat servers, but it's a perfect aircraft to do aerobatics. Even though it's in beta and some features aren't complete, I'd recommend it to anyone who's interested in aerobatics or just wants to learn how to fly a full fidelity airplane that isn't too complex. *Special thanks to VEAO Simulations for providing me with a copy of the Hawk for review.